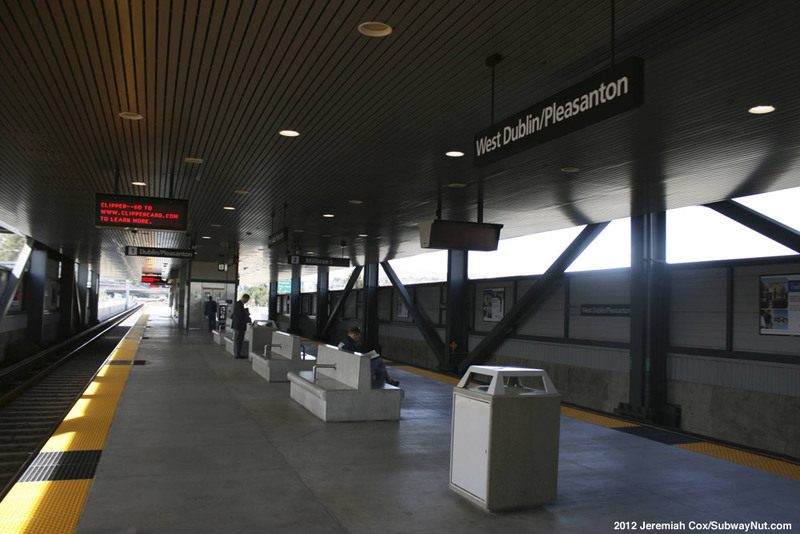 West Dublin/Pleasanton opened as an infill station on February 19, 2011. 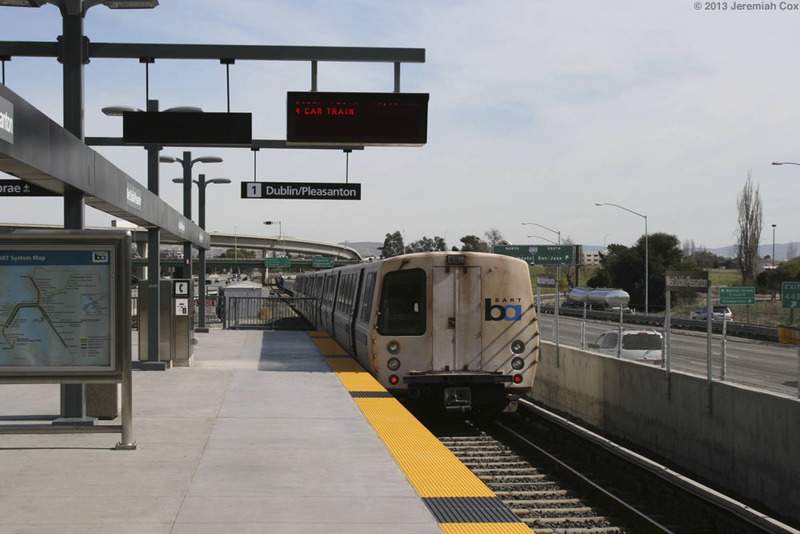 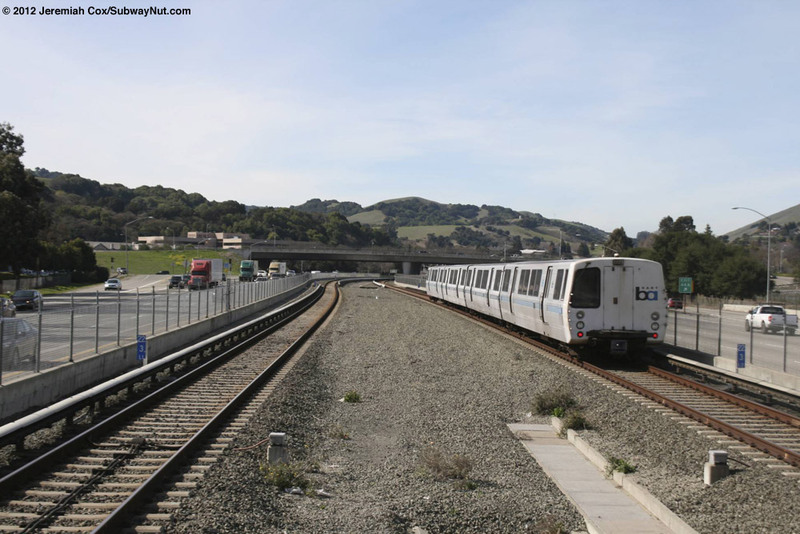 It was originally planned as a stop on the original line when it opened in 1997 but was shelved due to cost, minimal provisions for the station were included during the original building of the Castro Valley Extension to Dublin/Pleasanton. 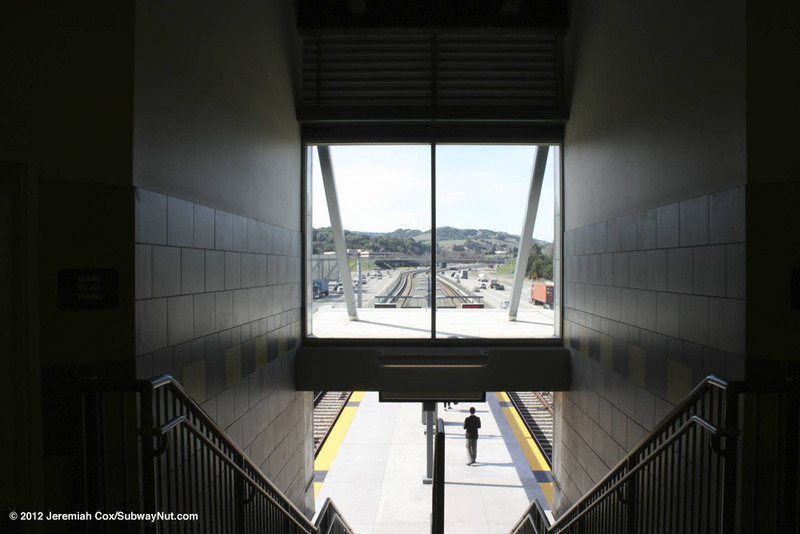 The station was built to serve new Transit Oriented Development opportunities, some surrounding office parks and provide more parking. 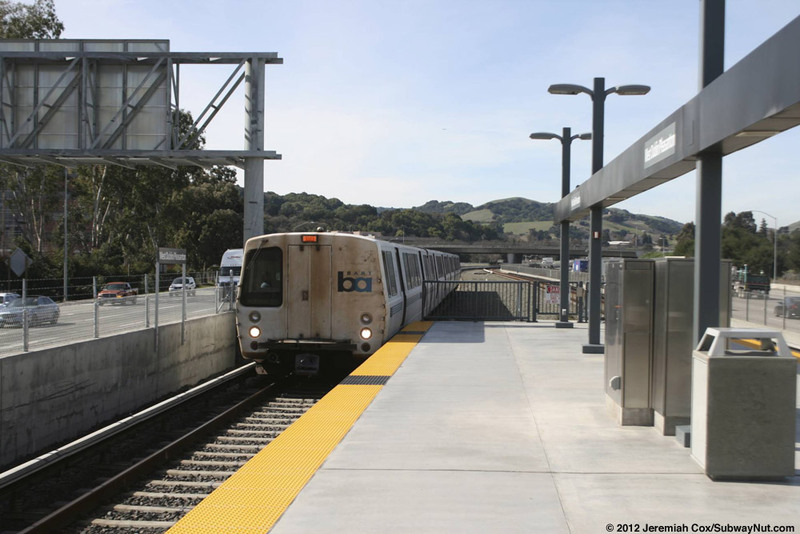 Funding for the station was provided using a Public Private Partnership from the TODs including on BART owned land around the station. 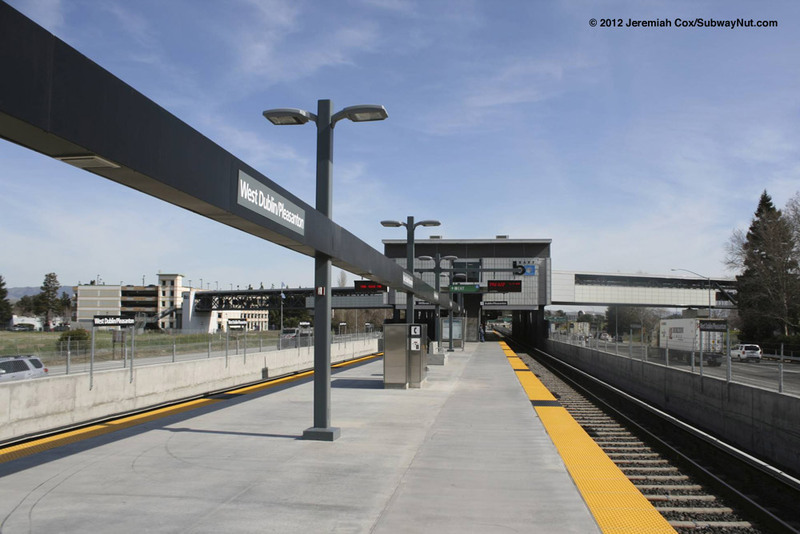 The station consists of a single island platform that is more modern than the other two stations on the brach. 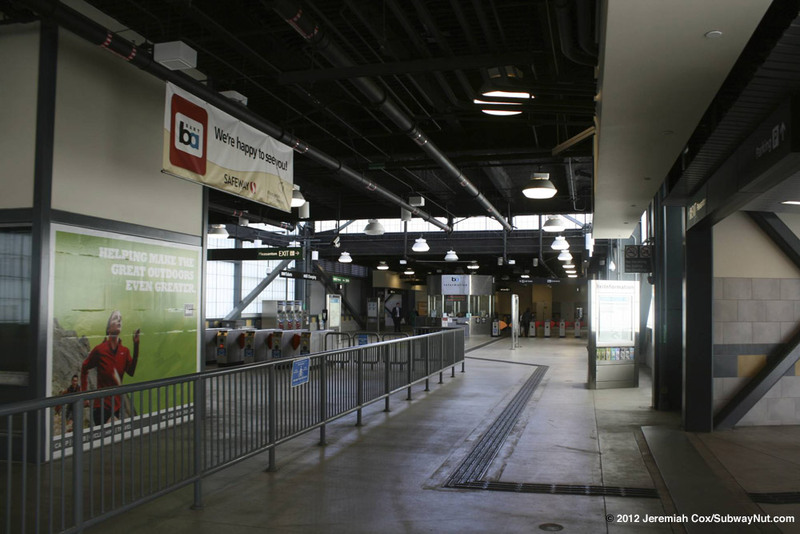 It opened with larger font black signs and Green Exit signs that BART is slowly rolling out during other station renovations. 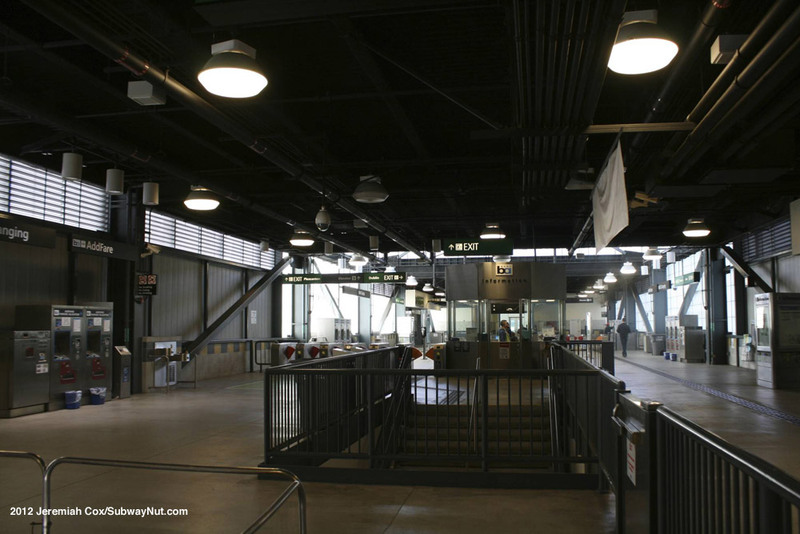 The middle half of the platform is built over with a mezzanine that has modern silver and white walls. 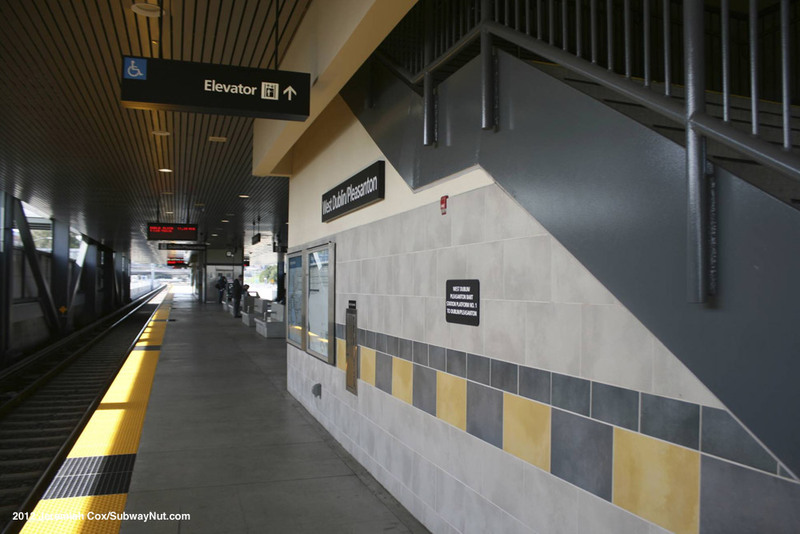 This provides the only shelter on the platform. 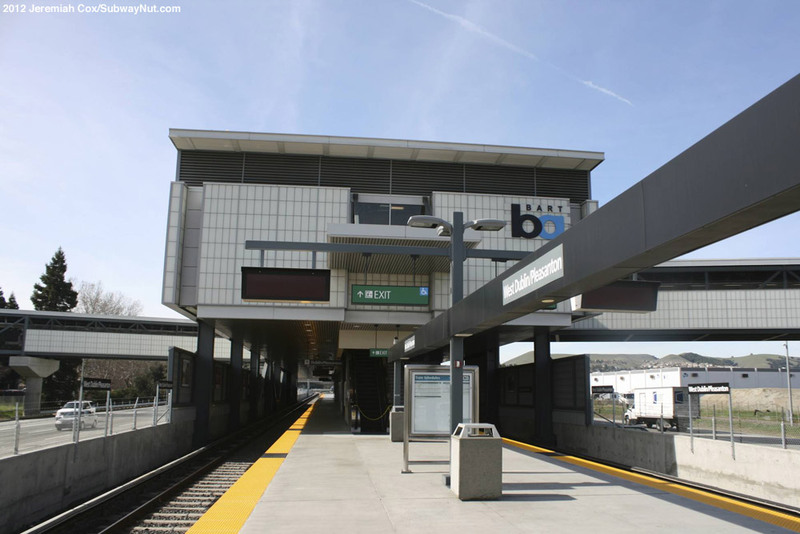 The ends have simple black lampposts, with a black beam in the middle of them with station name signs. 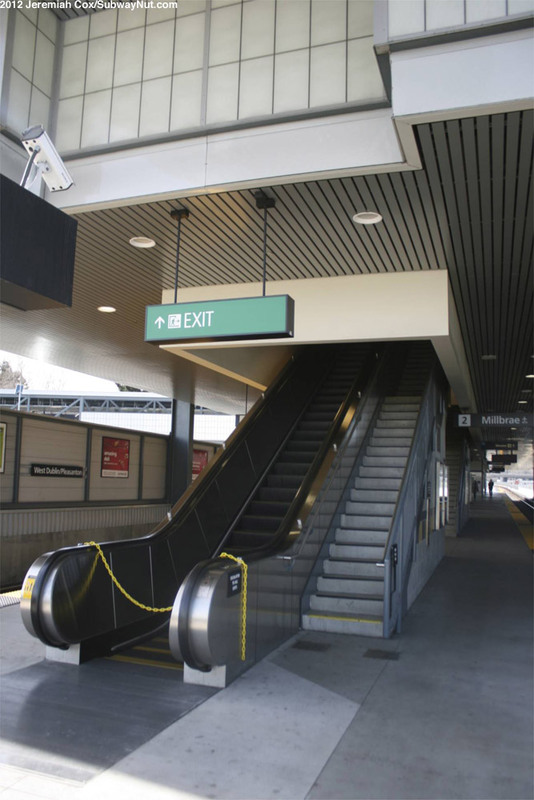 The mezzanine has two separate sets of fare gates each with a staircase, and escalator/staircase from the platform (the west exit has the platform elevator) between a central corridor outside of fare control that provides an out of fare control connection between the two pedestrian bridges above the freeway lanes to leave the station. 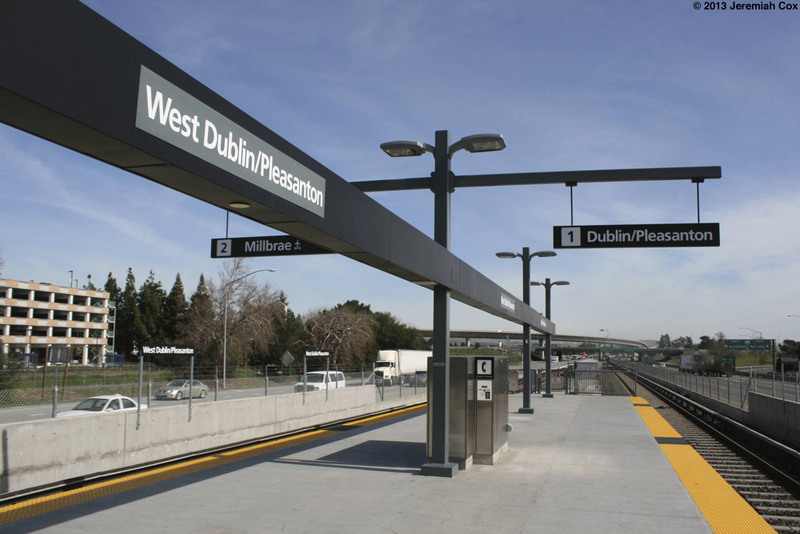 The bridges, one to the City of Dublin (north) and the City of Pleasanton (south) are not directly across from each other. 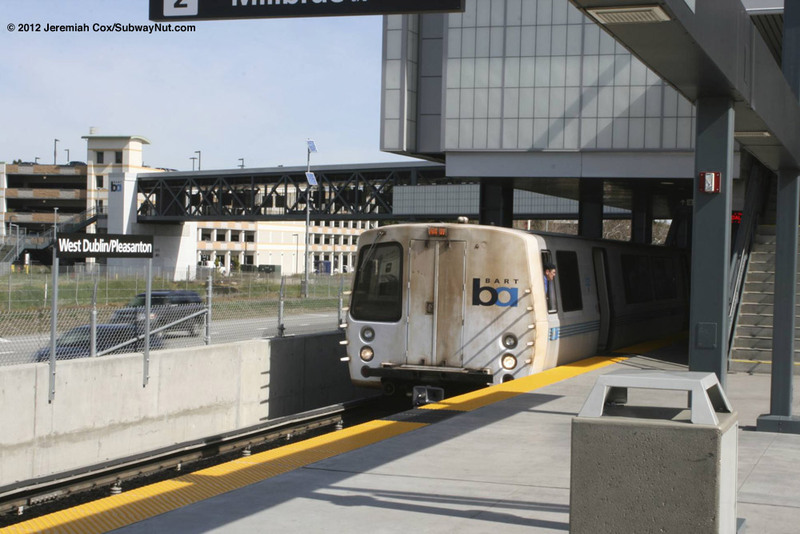 The bridges start with white walls closest to the station before coming mesh. 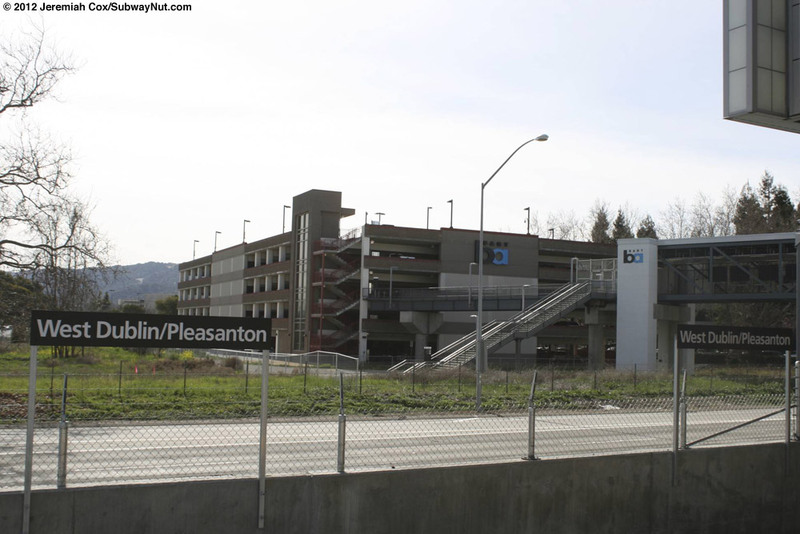 The Pleasanton one is slightly farther west, both lead to the third story of 5 story parking garages. 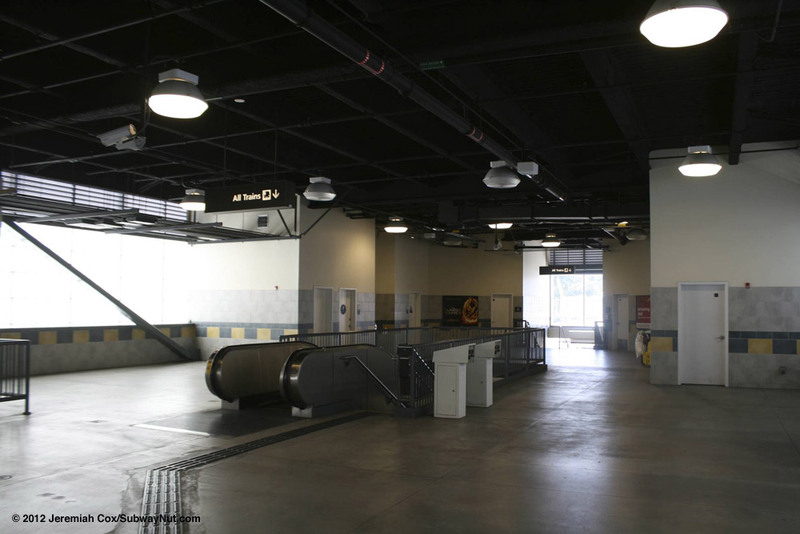 The garages are nearly twins with modern accents of colors on the concrete. 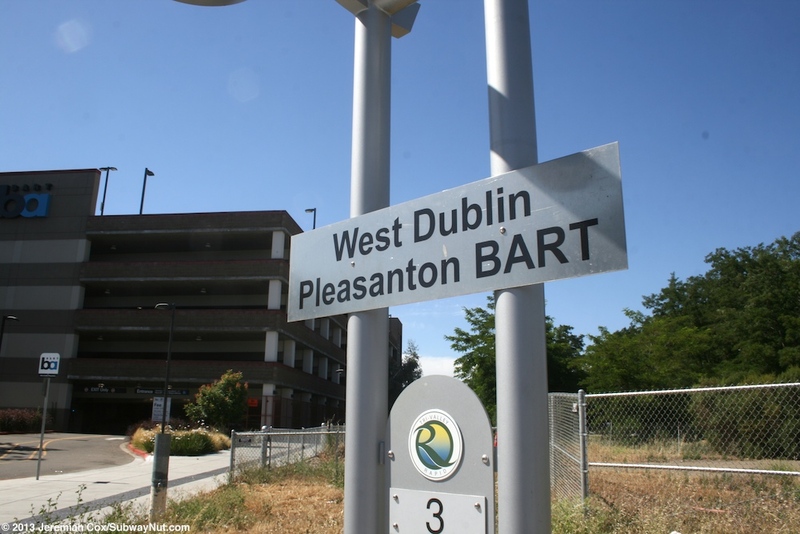 The Dublin garage has 722 Spaces, and the Pleasanton side has 468 spaces. 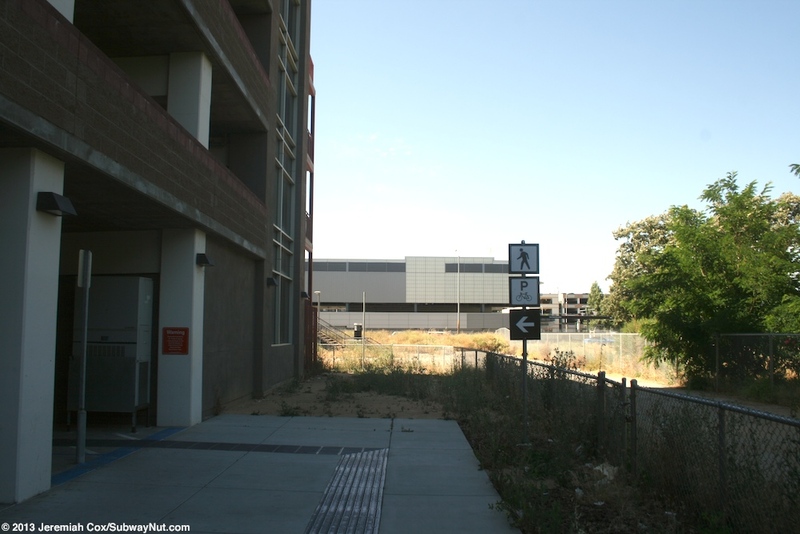 On the Pleasanton side pedestrians must go down to the 1st level via staircases within the garage (that isn't well marked) to a path along the east side of the garage to Stoneridge Mall Road to finally reach the nearest street (the mall is through the parking lots across from here). 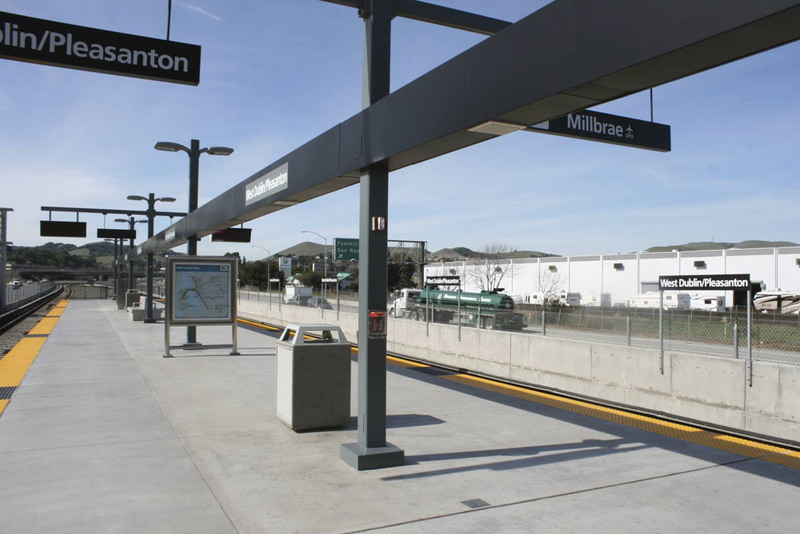 Here passengers finally get to the Pleasanton Bus stop LVTA Wheels Rapid Route and Route 54 that is the bus connecting BART and the Altamont Commuter Express Pleasanton Station with shuttle trips only to and from the four daily ACE Departures. 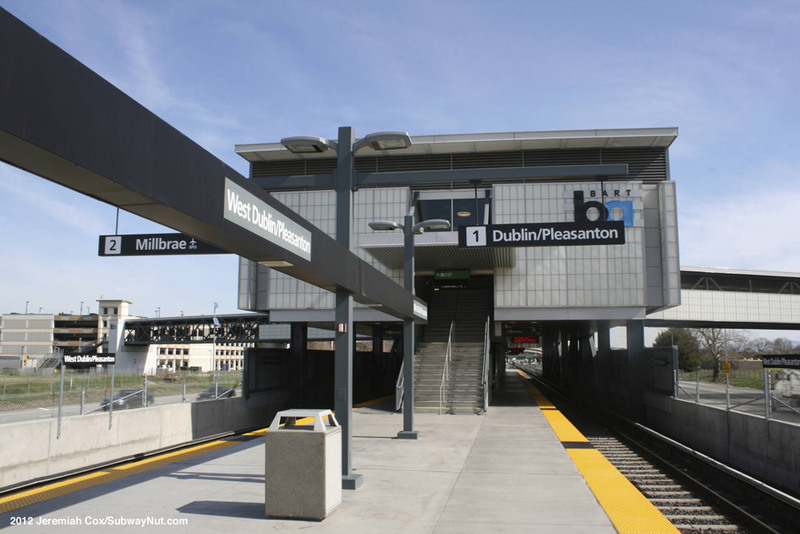 The Dublin side leads to a staircase down to a larger bus stop area along Golden Gate Drive (just simple bus shelters) and the walkway continuing into the parking garage where all ADA access is provided. 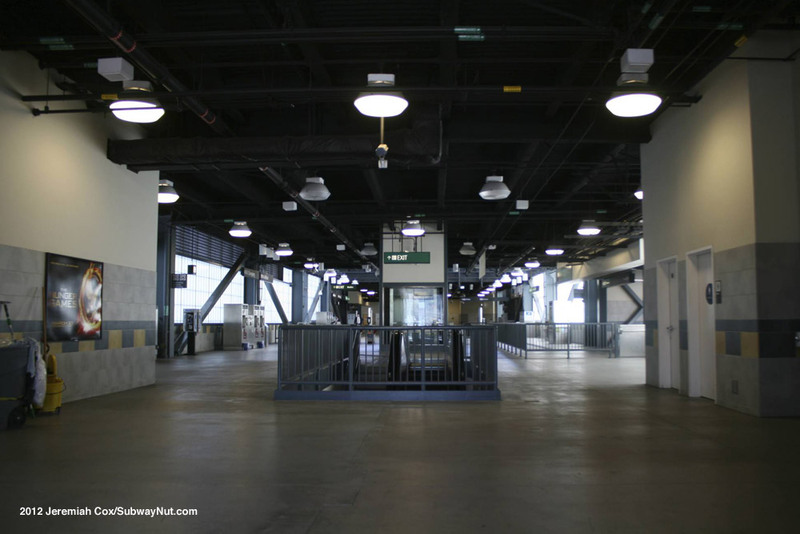 The two walkways have closed off but fully built out (more than just emergency exits) staircases in a couple places that are designed to lead to the various proposed Transit Oriented Developments when they are finally built.